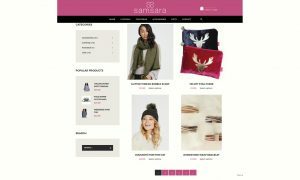 How well considered is your logo? Cast your mind back to when you first created your logo. Can you remember the process you went through that led you to choose the final design? If you’ve been reading my articles for a while, you will know that your brand is more than just your logo, but this is very often where it all begins. Well, that’s not quite true! 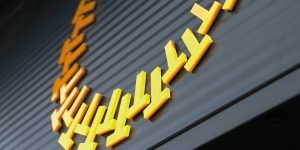 Whilst the logo might be the first visual to your brand identity, there should be a considerable amount of research beforehand. Any designer worth their salt should be curious about your business. They should be nosey! 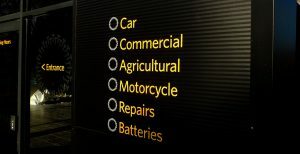 Asking lots and lots of questions to get a deep understanding about the essence of your business and what’s important to you; your values, the types of customers you wish to attract and the value you provide through your products and services. The research and understanding phase for brand design is crucial to give your designer a good understanding of the personality of your business as well as a clear design brief before the designer gets to sharpen their pencils. Let me give you an example. 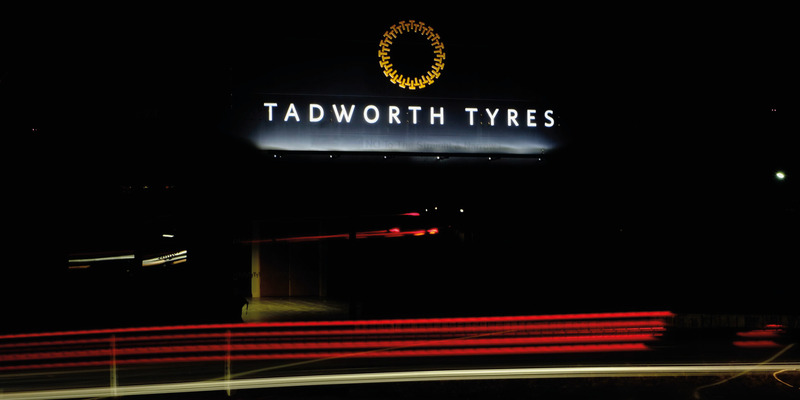 Having visited the site of Tadworth Tyres and spoken at length to Duncan, the Managing Director, I was able to really get under the skin of the business. This allowed me to go away, reflect on the research, and use my creativity to translate what I had discovered into a selection of graphic ideas to represent the brand’s personality. So the next time Duncan and I met, I was able to show him these four very different concepts and discuss which idea would most closely match the brand. 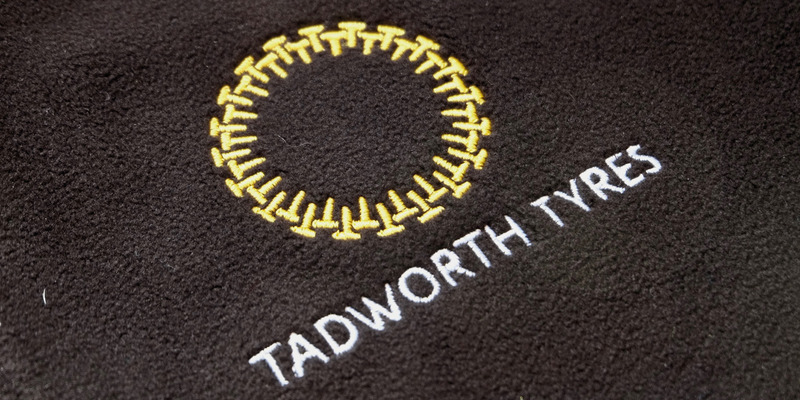 • The first design with the shield and EST: 1974 reflects the heritage of Tadworth Tyres: they’ve been around since 1974 and we discussed how important this aspect of the brand is to the business and for their customers. 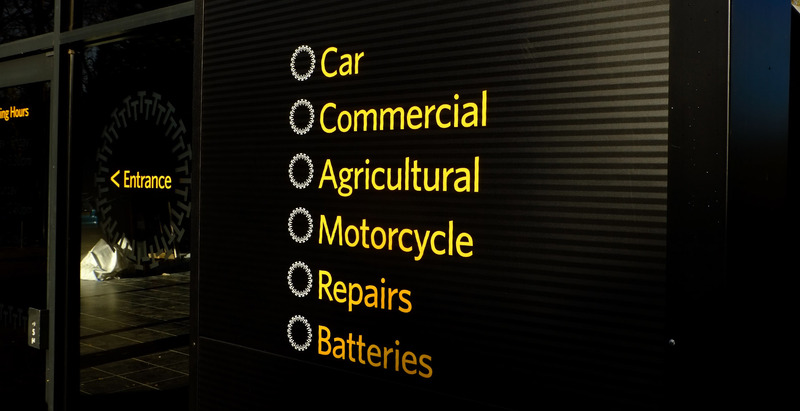 • The second idea is a play on the initials of the business and the tread of the tyre. I didn’t want to deliver a clichéd design showing a literal representation of a tyre but I thought this was subtle. 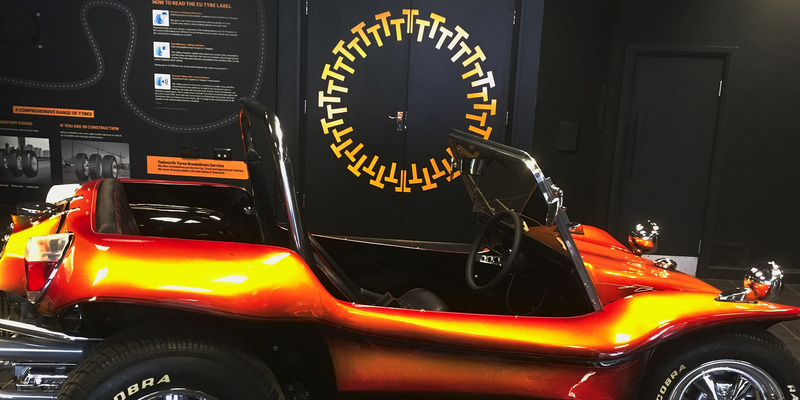 • The third concept is in a more modern style, loosely representing a racing track, and this stimulated discussion about how we could position the brand away from the traditional tyre service image. • The fourth, again a play on the initials, is exploring the opposite end of the spectrum to the first, ‘established’ concept with a modern feel. After considering the range of ideas, the second concept was felt to fit the brand perfectly. My next task was to spend time carefully crafting the idea into a finished design: making sure the colours were exactly right, the typography elegantly balanced and that we had enough versions of the logo to allow for use on signs, website, clothing and other applications. It’s really important to spend time at this stage to ensure the logo will work as well on a website at thumbnail size as it will at supersize on the side of a building. As you reflect on the process you went through when your logo was designed, I sincerely hope you had meaningful choices that weren’t just variations on a theme and that your final logo was beautifully crafted. 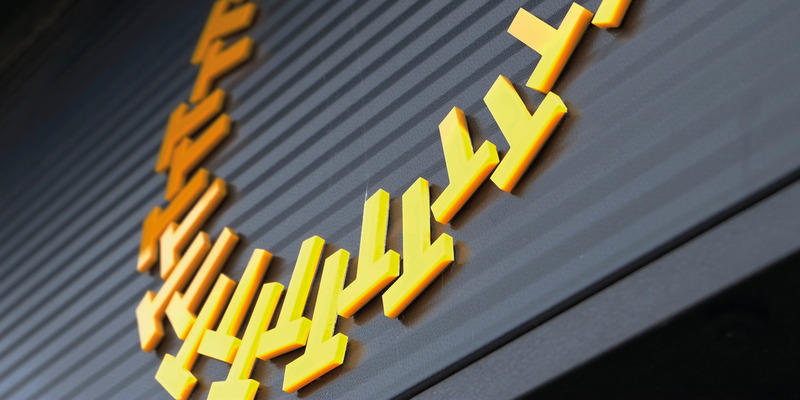 Once the design of the logo design has been finalised and signed off (some testing may be necessary at this stage), the next job is the implementation across all touch points that a prospect or customer has with the business. 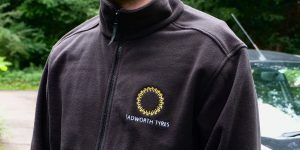 Successful branding design is not about simply applying your logo to all communications material, signage, uniforms etc. It’s about carefully crafting everything with a consistent design style that repeatedly communicates your brand personality and engages with your customers. Everything sings the same tune, in tune. 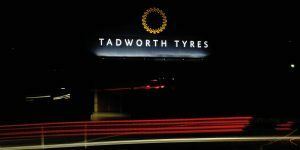 Duncan Hamilton, MD Tadworth Tyres. With every brand I help create for a client, we are aiming to achieve a world where every aspect of their branding is something they are proud of. Next time you see your logo, think to yourself, are you proud of your logo? If not, maybe we should talk. Please do get in touch. You can call me on 07876 293885 or email me. 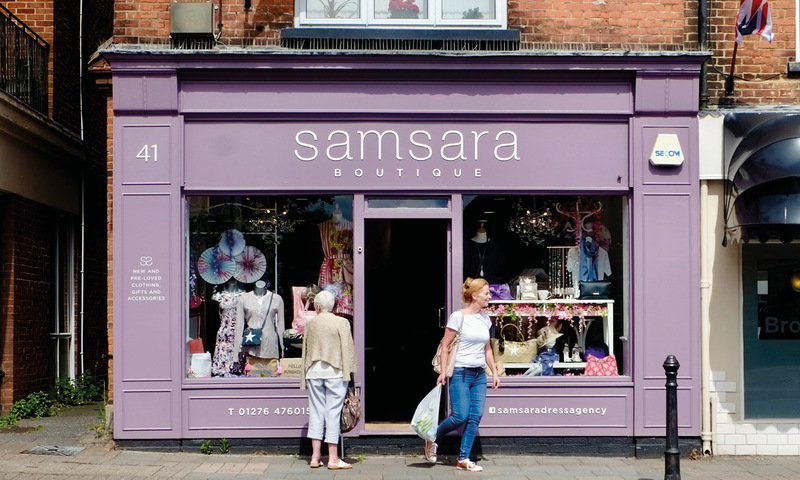 I created the branding for Samsara a few years ago whilst working as Nomo Strategic Marketing and Design. 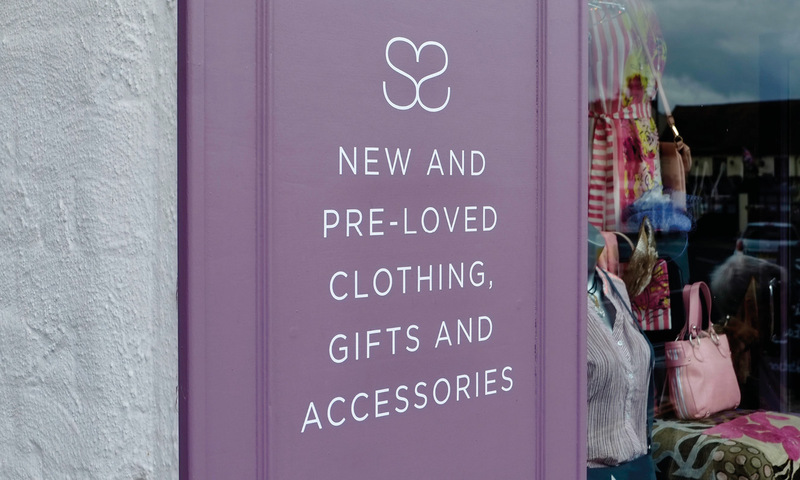 Emily Browne, the owner, wanted a name and logo to launch her dress agency in Bagshot Surrey. Early in 2017 I dropped into the shop to check that all was OK and to ask if there was anything I could do. 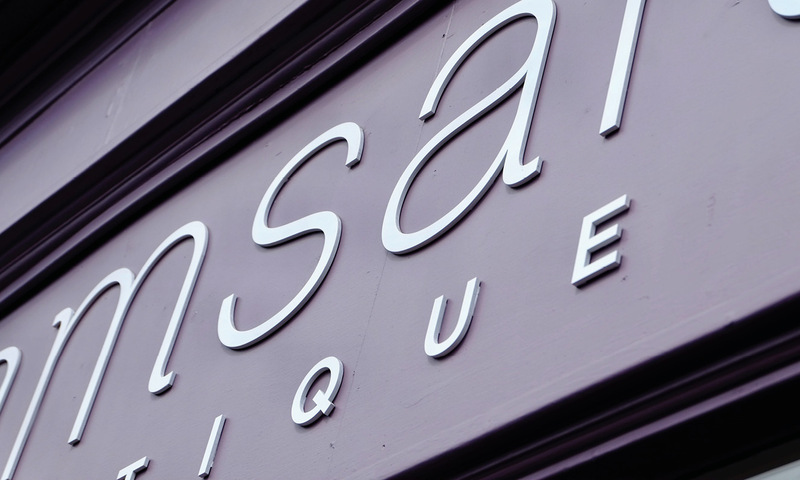 Emily explained that she was moving to a new, larger premises a few doors up in Bagshot High Street and needed some help with exterior colour and application of the branding. I suggested a number of signage schemes and alternative colours ranging from subtle to vivid hues. After checking paint samples, Emily and I agreed on a colour named ‘Dusted Fondant’ for the shop exterior. 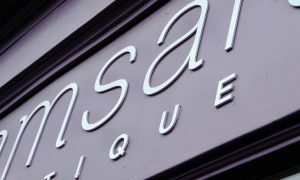 I obtained estimates from signage companies for the manufacture and application of the laser-cut acrylic lettering from my scaled artworks. 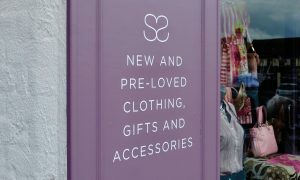 The entire shopfront was painted before the installation of signage. 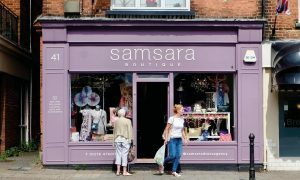 Samsara opened in May 2017 and its strong high street presence is now attracting far greater numbers of customers than at the previous premises. 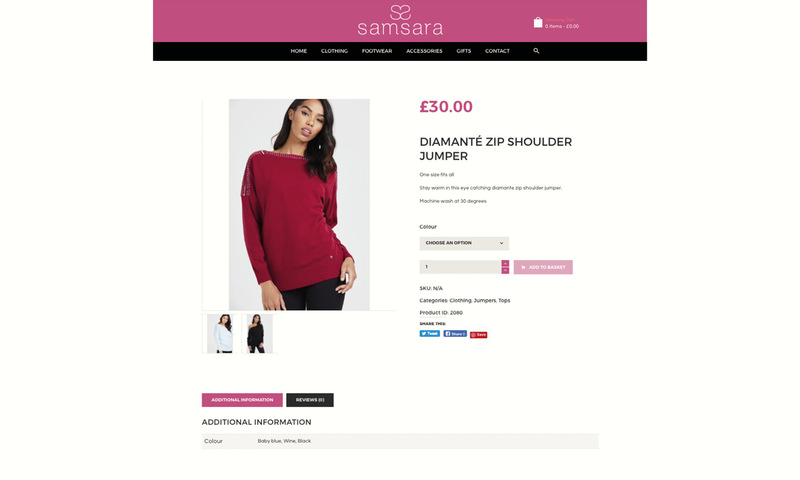 The next strategic step for Emily to develop the business was to take the brand online and sell her merchandise to a wider audience through a bespoke e-commerce site. Design work on the new site commenced in September 2017 and the build was undertaken by my digital partner Taybridge Consulting. We trained Emily on how to update content, use the payment gateway and shipping tools and went live in mid October. 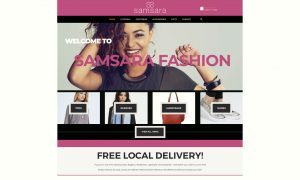 View the Samsara Fashion website here.